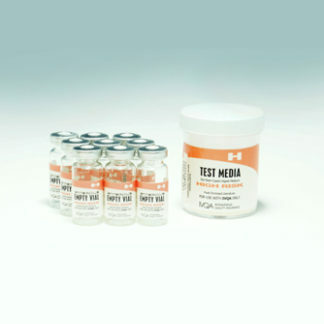 IVQA Low-Complexity Media Fill Test Kit will provide you the tools to comply with the Media Fill Test Procedure standards in USP on aseptic manipulation skills, including representative sterile microbial culture transfer and fill challenges. Our test kits are designed to document correct personal technique and effective environmental control for the preparation of low complexity compounded sterile products (CSP’s). All employees compounding low complexity preparations must have successfully passed the low complexity media fill test procedure annually. Administration should maintain documentation of employees successfully passing the low complexity media test procedure and the timely annual reassessment. Revised USP regulations mandate that training programs include a hands-on demonstration and practice with actual items such as CSP containers, devices and equipment. Regulations also require the caregiver practice aseptic and injection technique under the direct observation of a health professional. The caregiver is expected to demonstrate mastery of assigned activities before being allowed to administer CSP’s unsupervised by a health professional. IVQA media contains Tryptic Soy Broth, which helps detect evidence of a wide variety of microorganisms, especially common aerobic and facultative anaerobic bacteria. 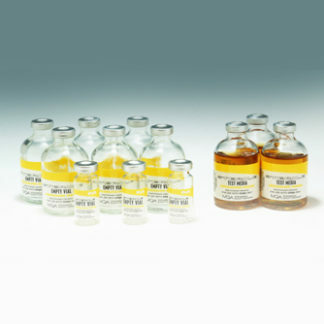 In an ISO class 5 air quality environment, set up 3 sets of 5-mL vials, each set containing 4 vials (total of 12 vials). Set up three 50-mL sterile crimp capped vials. 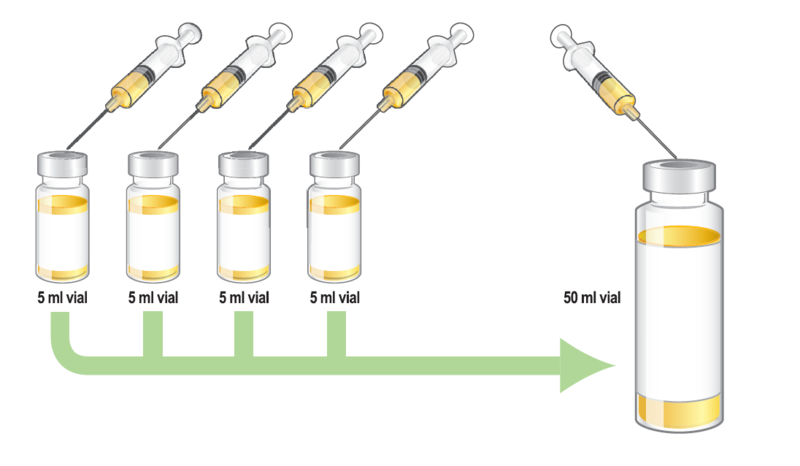 Now, by use of a syringe and vented needle combination, transfer all the contents of 4 of the vials into an empty 50-mL vial. This should be a total of 20-mL in each 50-mL vial. Repeat this procedure for Set 2 and Set 3. (Note: In the transfer process, insert the needle into the rubber stopper and empty the syringes contents. Label each vial with the employee’s name, and the date and time the vials were prepared. 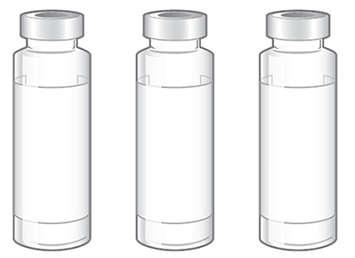 Aseptically affix a sterile adhesive seal to each of the three filled vials (i.e. in addition to the stoppers, the top of the vial must be covered with another seal). Incubate the three 50 mL vials at the 25 to 35 degrees of 14 days, if at the end of this time the solution is clear this denotes a pass, if it is turbid or has a precipitate this indicates a failure. 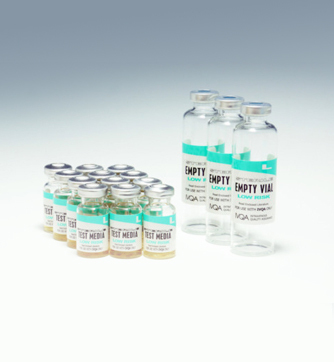 In most cases, a vial that fails to pass will become turbid or develop precipitate within 7 days. The test must be carried out to completion without interruptions. Test performance conditions should mimic the usual work environment. To understand when a Low-Complexity Media Test Kit is appropriate, below is a USP description of Low Complexity CSPs.